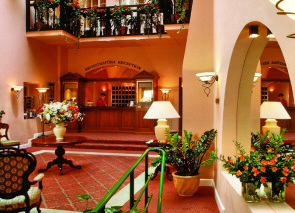 The hotel is a member of Summit Hotels & Resorts, a prestigious collection of independently owned luxury hotels. It is very centrally located on the main Pilies Street and it draws attention for its pretty medieval arched entrance. 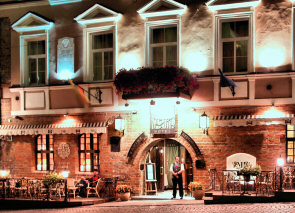 Dating from 1581 Narutis is the oldest hotel in Vilnius. Because of its convenient location you only need to step outside to find a number of boutique shops, restaurants and pavement cafes. Just a short walk from the hotel you will find a few landmarks including Gediminas' Tower, the Cathedral, and the beautiful St. Anne' s Church. 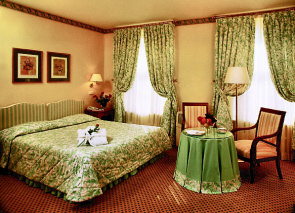 The Hotel has 50 rooms including 2 Suites with Turkish bath and Jacuzzi, 7 Junior Suites (you may choose a room with a balcony or 16th century frescoes). There are also non-smoking rooms and rooms for disabled people. 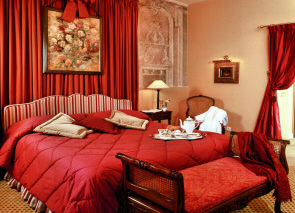 Rooms are individually furnished with stylish Lithuanian and French furniture and extravagantly decorated with unique frescoes, wall paintings, original beam ceilings, timber-framed floors or Gothic vaults. The beautiful interior is meant to recapture some of the enchanting atmosphere of the past centuries. The pretty inner courtyard is filled with flowers. Like other luxury hotels in Vilnius, Narutis offers all modern facilities. Each air-conditioned room has a mini bar, safe-deposit, wireless Internet connection, satellite TV with English, German, French and Russian channels. All bathrooms have modern equipment, including hairdryers and other conveniences. The hotel services include room service, in room check-in, laundry, dry cleaning, babysitting, Concierge, ticket reservation, free parking, luxury car rental, airport pick up and a jewellery shop. 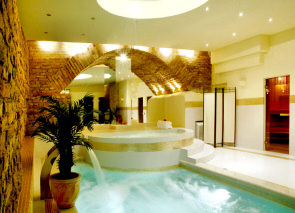 In its 16th-century cellars the hotel has an extravagant health and leisure centre with a swimming pool, Jacuzzi, sauna and Turkish bath, gym and a special massage parlour. The entrance fee for accommodated guests (9 €) however surprised me. Nevertheless the spa centre and sauna are excellent and make a very nice asset. Narutis hotel also offers a café on the ground floor and the atmospheric red brick restaurant set in the vaulted 16th century cellars. They serve tasty European and Lithuanian cuisine. Charges are applicable for the usage of the Spa facilities. If you wish to read other people’s reviews who stayed at the Narutis Hotel, check out room rates and available booking dates, click on the link below.